ENSO - a BOLD acronym for euphemisms - confusion reigns - or is that "to rain, or not to rain"? What is it that we are really trying to convey, or codify when we use these brief sound bytes - as new words? Apparently we are trying to convey complexity, by wrapping what little we know and almost agree upon within a tidy short label - i.e., El Niño - Southern Oscillation. The problem is that these are complex, interactive processes, for which we have only a few years of relevant observations. All climate knowledge beyond the recent age of technology and observation is provided by proxy information, e.g., ice cores, tree rings, flood scars, and sediment records. Within these records, particularly the higher resolution laminated, or varved sediments, and the longer ice cores there is a strong coherence, and depending upon where the materials were located, there are often strong ENSO-like records, suggesting that this a long ongoing process. The problem is to identify all the phases, stages, and their precursors, and consequences - and then formulate the right question(s) for given contexts. El Niño is a euphemism for many diverse symbolic concepts and experiences, including: 1) Latino cultural "Christ Child" association of Warm current with the Christmas season; 2) the Intergovernmental Oceanographic Commission's 1980 Working Group definition of El Niño as a 2 degree Celsius temperature rise off the coast of Peru; 3) a period of extreme drought and uncertainty in the northern territories of Australia and across Indonesia - often with tidal levels that innundate the streets of Jakarta; 4) cold and rainy periods for New Zealand; 5) remarkable post winter "desiertos floridas", wildflower blooms associated with heavy rainfalls in normally arid deserts of Chile and the southwest region of North America; 6) heavy rainfalls in usually arid nothern coastal Euador and Peru; 7) drought across northeastern Brasil; 8) frozen lakes, rivers and olive crops across the UK and Europe; 9) Sahel Drought and Nile Floods; 10) Asian Monsoon extremes; 11) Droughts in northern China, and so on, as one follows the phenomenon around from one hemisphere to the next. While phenomenology such as El Niño has complex, often confounding meanings to different peoples, in different places, the Southern Oscillation is well defined - most concisely - as the difference in pressure at sea level in Darwin, Australia, and that of Tahiti. Records are routine daily barometric measures, that are summed (variously) into monthly averages, so that they will plot conveniently onto a single page of a report. The Southern Oscillation records are available, with the exception of a few years and occaisional months from the late 1800s and early 1900s, making it one of the longest and more comparable numerical data sets associated with the El Niño phenomenon. We are then, again, submerged into confusion, by the multiple uses of another euphemism, the Southern Oscillation Index, which is a family of "standardized" treatments of the very "busy" surface pressure measurements at Darwin and Tahiti. After the fact, a typical SOI Index may be a time series plot of the Standard Deviations or time- averaged measurements, usually eliminating most of the daily, and weather related "noise". When the pressures around Tahiti exceed those of Darwin, the SOI becomes negative. The negative extremes of the SOI are coincident with what are now called El Niño or ENSO Warm events in the Pacific Basin. After considerable study, and thinking about the processes involved, the rates of planetary warming (via insolation) and cooling via Outgoing Long Wave Radiation (OLR) has become another sort of valuable information about ongoing planetary energy balances and processes. The complex interactions between atmospheric moisture, clouds, insolation, and ocean surface energetics also tend to be confounding, and one really wants to know as much as possible about local and regional heat balances, and imbalances. Understanding both the upstream and the many downstream progressions of these imbalances is critical to credible forecasting. Therefore, various SOIs and OLR are often plotted together, although the OLR measures are satellite based, and only exist for the recent two decades. This treatment foreshortens our real experience. El Niño phenomena that have been ascribed are associated with extreme negative Southern Oscillation Index (SOI) values, while much of the SOI time series exhibits poorly patterned, continuous transitions from high to low values, with most values being positive. At the other extreme of the Southern Oscillation Sea Level Pressure at Darwin are relatively high, creating a positive SOI, and a Cool Event. 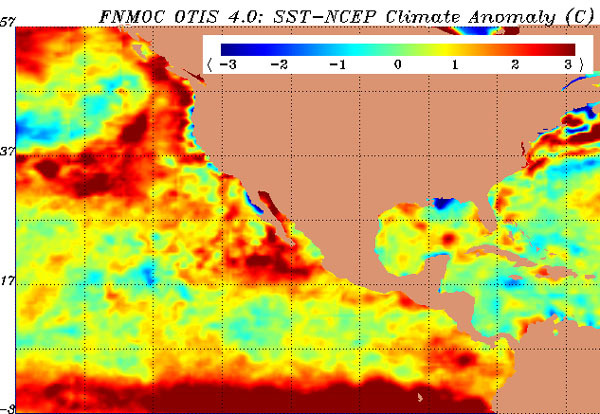 Click on Oceanography link - and move your cursor into the NCODA options: 1st look at the Sea Surface Temperature Map - Then the SST Anomaly - to see how today compares to long-term mean temperatures. These data sets are updated every 12 hours. FNMOC data include climatologies, nowcasts, and forecasts from a family of ocean and meteorological models. The difference between the observed and the climatological mean is the Anomaly (below), which is used to track changes, and patterns, as they might be associated with the climatology, or "expected" seasonal weather. Higher resolution information, focused on North America, exemplify the local structures that influence the coastal ocean ecosystems in particular. Note particularly the anomolous strong upwelling along the west coast, in contrast to the intense aggregation of warm ocean offshore. This portends to be a unique and dynamic hydrologic period for the regions downstream. Because of the long memory of the upper ocean, and planetary physical processes, no two ENSO events really act like another of the same labeling. Note particularly that the "usual" October - November Kelvin wave temporal coherence is absent in the presently ongoing phenomenon. I have purposely not shown specific maps at peak warm and cool phases of ENSO. Peak temperature months for the dynamic northern oceans occur later than one might expect, often well into October, as a consequence of circulation and cloud mediated insolation. It is important to understand these are "normal" monthly mean patterns, within which the climatic extremes comprise significant, but not strictly canonical components. The ongoing "event" makes this point. In contrast with the above Cool phase Walker Circulation, that below is associated with El Niño, or the eastward progression of the upper ocean Warming, usually associated with relaxation of the surface easterlies, and an eastward propogating gravity (Kelvin) wave. Comparison of upper ocean temperature patterns is a useful starting point for developing ocean ecosystem scenarios, and fisheries responses. The slope of the thermocline, an important characteristic that defines a region's energetic status, is due to both the surface winds and the general basin circulation as a consequence of the Coriolus force. Sea level tends to be higher in the west, as a general consequence of lower salinities - a consequence of higher levels of precipitation - and current and ocean basin boundary dynamics. This sets the scene for a dynamic situation, leading to the El Niño phenomenon that preoccupies most people. A linking model is diagrammed below, that is meant to create a better appreciation of the multiple interactions and cloud mediated dynamics that promote the transitions between the two diagrams, above. 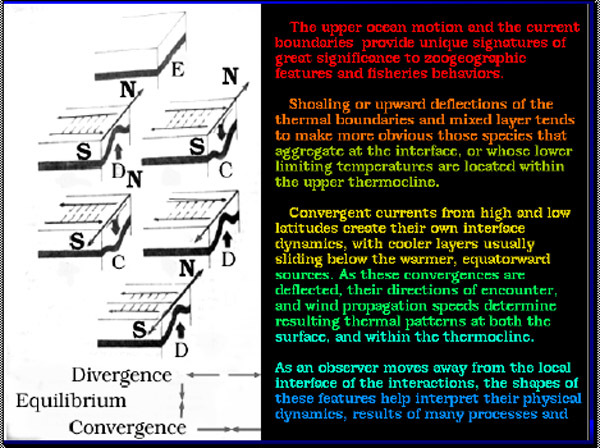 Pay particular attention to the upper ocean dynamics, and Langmuir cell formation, that is night time cloud dependent. Critical temperatures (SST >27.5C) are attained in local situations, leading to enormous expulsions of energy - somewhat "quaintly" labeled "deep convection" by meteorologists - few whom have ever been in these locations. As a result they are poorly studied - a consequence of the dangers involved in being on or in the ocean at these locations. There is another approach to the feed-back between the emanation of energy from the sun, into the ocean's surface, and within it, in a sort of "Do-Loop" that preordains a downstream progression. These heat transfer events cycle within the marine layer, within the ocean, and also across the tropical rainforests, providing a continuity that was first described by and is undergoing further investigation by Dr. Warren White, of Scripps Institution of Oceanography. He has tracked the progression of these "boluses of heat" in the upper ocean from the equatorial regions into the Southern Ocean, as well as across the equatorial Pacific into the Atlantic basin, via the ocean and the Amazon forest. These events proceed at between 5 and 10cm per second, or about 1-2,000 nautical miles per year, traveling eastward, and poleward around the world. The missing critical components from climate models are the properties that drive ocean ecosystems. These physical properties are associated with eco-physiological situations in the ocean, such as light levels, temperature structures and upwelling/ downwelling effects. On land, it is all about soil moisture, local winds and humiture, as well as light levels and onset of freezing. The biology is responsive on all time scales, and primarily local space scales. That is the result of another, but even more tangible "Do-Loop", the seasonal cycle, and the resulting ecosystem interactions. As ocean climate varies, so will local and downstream ecosystems. Ocean temperature has a top-down pattern, while the ocean ecosystem is responsive to procesess that emanate from above, below, and in between. General changes in slope of the thermocline, and empirical knowledge of the upper ocean warming or cooling in the eastern Pacific as a consequence of relaxed or enhanced Trade Winds and clouds, particularly at night-time, has profound direct consequences on both species interactions and primary production. 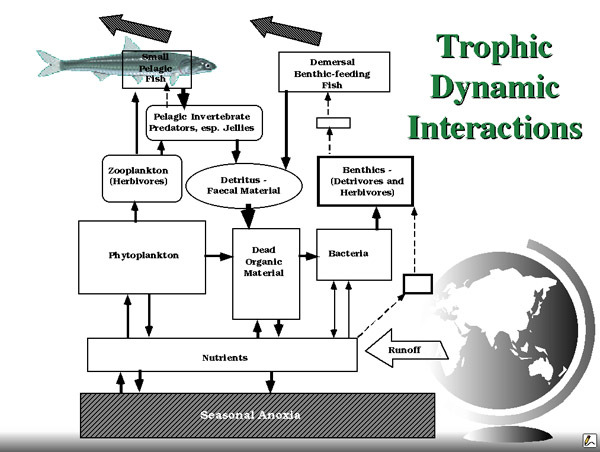 Warming conditions tend to enhance respiration rates, stratify the upper ocean, speed food web throughput, and generally decrease upper ocean primary production and species abundances as a consequence. The opposite conditions tend to yield opposite ecological consequences, good for some species, not so good for others. The sequence of changes in local contexts, is remarkable, and often begins before those concentrating on ocean surface observations have any hint of ongoing changes. Light is the primary engine affecting production levels. This has been a sort of history lesson. As sources of insight, the SOI and COADS have provided most of the historical physical perspective. Extending ENSO time series backwards beyond these short data sets will require real detectivery, as an increased knowledge base must be formulated out of analogies. This is done by use of proxy data for phenomena that we have correlated during the recent century - or less - with what are recognizable, if not really well defined El Niño or other climate-defining events. Extreme rainfalls or droughts are often used as El Niño proxy indicators, but the California Storm records compiled since the mid-1800s and collated by James Goodrich, retired California Climatologist, tell another tale. The present equatorial SST anomaly pattern, is a result from relaxation of the Trades, in March, released a Kelvin wave that "looks like" El Niños of years past, but occurred 6 months out of phase. However, the warm anomaly off North America's west coast is unusual, and unrelated.